Andes, campmg the Canadian Arctic, and mountaineering in the St. Elias Range. He married Marion Diane Low September 10, 1983. They lived in North Vancouver from 1987 to 1999. They then moved to Gibsons, BC, on the Sunshine Coast. Marion worked in a bank but is now a full­ time mom. They have two children: Emily Martha born November 10, 1990; and Thompson Andrew Magnus born January 2, 1992. The children enjoy school and sports. Over the last five years, they have become involved in sailing and skiing. Ryan still carries on with photography. Connie Christine. After graduating from high school, Connie worked for Otter Co-op in Aldergrove, and then took some time off and travelled around Europe. She was employed at Van-City Credit Union. Connie married Mike Linde on October 18, 1986. After the children were born, Connie became a homemaker and full-time mom. She occasionally supervises at local schools during noon hours. Mike works for Northwest Rubber Mats Ltd. as a trnck driver. Their children are: Christopher Heino, born June 2, 1988; Allan Alexander born October 26, 1989; twins ­ David Michael and Diana Christine born May 5, 1991. The family enjoys the children's hockey and ringette. Mike coaches and Connie manages some of the teams. They are involved in school sports and ski and snowmobile at Grandma and Grandpa's cabin at Eastgate. They now live on a 13-acre hobby farm in Pitt Meadows. Carol Elizabeth obtained her Bachelor Degree major­ ing in criminology and an extended minor in psychology from Simon Fraser University in 1993. She has worked for BC Corrections Service since 1988. She is currently a probation officer in Abbottsford. Carol married Darren Koebel on March 30, 1991. Darren works at Riverview Hospital as a transport driver. They have one daughter, Amy Elizabeth, born March 19, 1999. Carol maintains her interest in horses and continues to ride whenever possible. They make their home in Aldergrove, Be. Since our 1984 history in ~ .to. Ei.cl.d Volume 1 till the year 2000, we have all aged 16 years, which places many of us in age of the 'Golden Years' filled with memo­ ries and gray hair (what little we have left); plus aches and pain. However, Ada and I got our wish to see the arrival of the year 2000. This had been our wish for a long time. In 1986, I sold Shellborn Enterprises, only to buy it back in 1989. After a few years, I once again sold the busi­ ness and it was renamed 'Dr. M.'. We bought a trailer in Magic Valley in Weslaco, Texas, and spent a number of enjoyable winters in the warm and sunny Rio Grande Valley. We met many beau­ tiful friends south of the border. In August 1991, Ada lost her mother at the age of97 and her only brother, Stanley, in 1997. 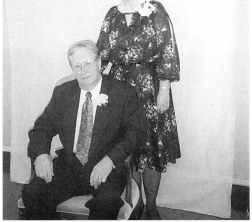 I lost my mother in 1995; also my sister, Mae, and a brother-in-law, Dorland Burkett. In July 1997, our granddaughter, Angela Shell born, married Darren Skog. They are now both teaching at Norway House in northern Manitoba. Scott Shellborn, our grandson, is still at Brandon University and works during holiday breaks and week­ ends. .Melnyk in August 1994. They have one son, David, born in March 1999. Our first great grandson! Tyler and Tracey are presently living in Regina, where he works for a radio broadcasting company. Tracey rnns a daycare from their home. They will be moving to Brandon early in the year 2000. Tyler will be managing a FM radio station. Myranda Bachewich, our youngest granddaughter, is working at the Toronto Dominion Bank in Winnipeg. In 1987, our children gave us a surprise 40th anniver­ sary and, in 1997, a 50th anniversary. In August 1997, we held a Shellborn Reunion to celebrate 100 years smce Grampa Theodore Shell born arrived in Canada from Sweden. Upon retirement, we spend many happy hours with our little musical band playing at various places such as care homes, bam dances, Legions, etc. May the 21 st Century be one filled with blessings for everyone.